← Yeah so I went to a chain restaurant. Wanna fight about it? I’m gonna make this a short one because, well, because I can. I’ve actually been holding this review in waiting, not wanting to bombard you with omelettes everyday. Here’s some big news though. Mikey and I will be guests on Words Cause, a live internet radio show Saturdays at 8am. Since most of the degenerates that read this site will still be sleeping it off, I don’t expect many of you to call in, but if you want to listen live, call in or even listen to the show after it airs live, here is the link to Words Cause Radio. Seriously, listen to us. Coincidentally, it was Dean and his lovely wife Amy who suggested the restaurant I’m about to review. It’s a little breakfast place tucked away in an industrial section of Newbury Park. Warning, this blog post has very few pictures. This place was pretty tough to find, so I wanted to keep that feeling for any of you brave enough to hunt it down. First off, a big thanks to Dean and Amy for not giving me directions to this place. At one point I thought I was gonna hit Vegas before the Side St. Cafe. Just when I thought all hope was lost, a sign miraculously appeared to guide me home. At first glance this restaurant is way out of place. It is in a converted office space that has been decorated to look like a Millie’s, but less creepy. I was greeted at the door and sat immediately, but I could tell that this was more of a locals spot. Everyone else who walked in was recognized by name, kids were doted over and cheeks were pinched. I was happy to have been left out of that last part as I’ve never been a fan of the pinching. The last person to try was my Great Grandma, but after the peruvian necktie I put on her, we haven’t really been in contact too much. I ordered my usual veggie omelette and the water/coffee combo that I love so much. I don’t care if I have to pee every 15 minutes, hydration is important. My meal got to me in record time. I’m talkin’ under 7 minutes. I don’t know how they did it, but I don’t really care either. As far as the omelette goes, there was only one truly remarkable thing about it. They put the avocado INSIDE. They must have done it right at the end though, because this was not brown at all. In fact, I think it might have been the best use of avocado in the history of omelette making. The eggs were cooked well and there was a lot of veg in this sucker. Here’s the lonely pic for you to digest. Caution object may appear smaller than they actually are. Also, they gave me salsa with the omelette. 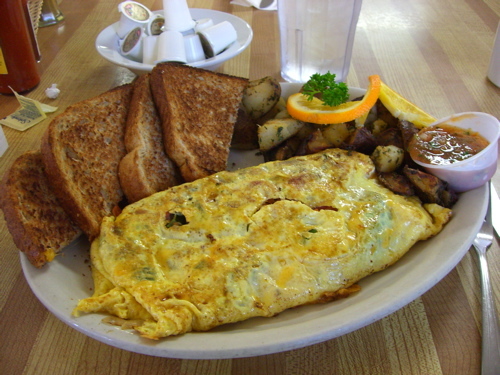 Believe it or not, that’s a first for the omelettes I’ve reviewed for EatMeCalifornia. I love salsa, so they get bonus points just for having it, but this stuff was actually pretty good. It also had the added bonus of making the omelette more savory. I abhor the salt shaker. The place where the meal took a nosedive was on the potatoes. They were dry, some were burned and they weren’t really hot. Burned and lukewarm, does not a good potato make. Next time I will take the fruit. This place served me a good omelette, but I’m pretty sure their unhealthy fare is where it’s at. Why else would they offer biscuits and gravy with every meal. I’m serious. On the menu it says Biscuits and Gravy, or Toast, which explains why my waitress looked at me like an alien when I ordered wheat toast. I half expected her to just bring out biscuits and gravy anyway. She didn’t. The prices are fair for the amount of food you get and the fact that it’s harder to find than the Dresden Room in Swingers is definitely a plus. The servers are nice and not unpleasant to look at (that’s for you Dean) which is always a good time. Plus there is a feeling of consistency. You know what you’re gonna get because the same owner has been personally serving it for the past 7 years. So if you find yourself in Newbury Park and hungry for a not-so-healthy breakfast, I definitely recommend the Side St. Cafe… if you can find it.